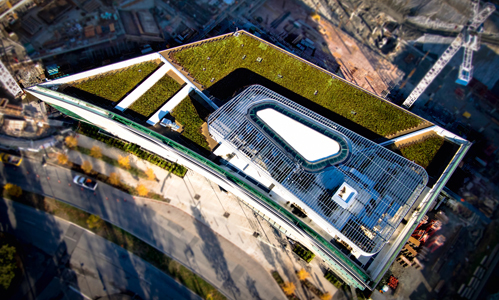 COLUMBIA GREEN TECHNOLOGIES offers innovative green roof solutions for extensive, semi-intensive and intensive roof gardens. Our products were engineered to maximize stormwater retention and create an environment for optimal plant health. We partner with leading manufacturers of waterproofing materials to offer a complete, single-source warrantied solution for every type of roof construction. We are committed to improving our environment and economy; our products are made in the USA and support low impact development, LEED building. We offer simple, economical solutions for every site and situation. Our staff of experts can help you find a solution that meets your design and budget restrictions. 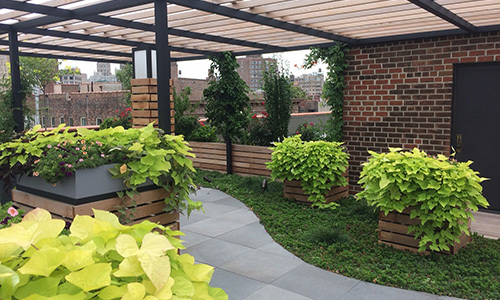 The Tray is a modular vegetative roof system designed for stormwater management and ease of installation. The trays are 2’x2’x4-5/8” in size. Because of the interlocking edges, excess media can be placed over the top of the tray for invisible tray edges when planted-in-place. Watch a short video of how the trays are installed here. The layered systems offer the most versatile construction and can be an economical option when budget constraints arise. Watch a short video of how the layers are installed here.